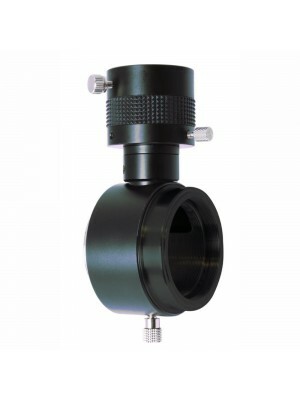 The RCC I (Rowe Coma Corrector) is a coma corrector designed by Dave Rowe that uses a 3 elements optical lens design, perfect for Newtonian telescopes from f/3.5 to f/6 (optimized for Newton f/4) and that offers a very long 91.5mm backfocus from corrector's back side T2 thread to the camera sensor. This makes it possible to insert, between corrector and the camera, also many accessories such as off-axis guiders, filter wheels or others! Unlike other coma correctors that increase the focal length of the telescope, the RCC maintains the focal length of the telescope that is used with: an f/4 telescope will be f/4! The 3 elements optical system of RCC uses Phantom Coating for maximum light transmissivity. Adding the optional RCC off-axis guider (that is screwed to the RCC I corrector T2 thread and that is 36mm thick), you still have 55mm back focus then just add a T2 ring and the DSLR camera body to position the sensor at the correct working distance. If you want to connect the camera directly to the RCC I corrector T2 thread (without off-axis guider), you must also insert the necessary T2 extensions.